The cd starts off with "Also Sprach Zarathustra (Theme from 2001)" and rolls into excellent performances of "See See Rider and Proud Mary." A very good effort on "Until It's Time For You To Go" follows and leads into the familiar coupling of "You Don't Have To Say You Love Me and You've Lost That Lovin' Feeling." Both are very well done. A long intro begins "Polk Salad Annie" and you can hear the twenty-one year old growl during the "sock alittle" windup. A brief welcome is offered while Elvis catches his breath and is subjected to about 2000 requests for one song or another. He gives the usual response of "I'll sing all 529 of 'em" and then admits he's also the world's biggest liar. But it's all in good fun so no offense is taken. 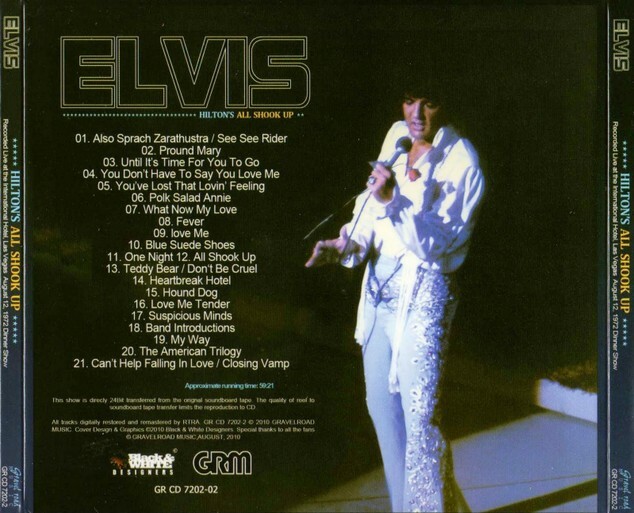 Getting serious for a moment allows the introduction of "What Now, My Love" and this is without doubt one of the most potent ballads ever performed by Elvis. Then follows a sensual performance of "Fever." Both of these songs were excellent additions to Elvis' live show. A generous medley of hits follows, highlighted by "One Night & Heartbreak Hotel." Mr. & Mrs. Tippler are then introduced as the couple who hired Elvis at Crown Electric in Memphis and he thanks them for the job. "Suspicious Minds" brings on some tree hugging comments towards Charlie Hodge during the bridge, but is wound up in the usual all out mode. Elvis then introduces his backing musicians and good friend Telly Savalas. "My Way" is the third new song introduced at this engagement and coupled with "An American Trilogy," make for a show stopping finale! Although Elvis made a few humorous cracks about not wanting "My Way" associated with his life-"the end is near and all that jazz; I haven't even spit it out yet, I'm still chewing on it," it's obvious he likes the song or he wouldn't bother with it. "Can't Help Falling In Love" brings the show to it's conclusion and is sung pretty much word for word. 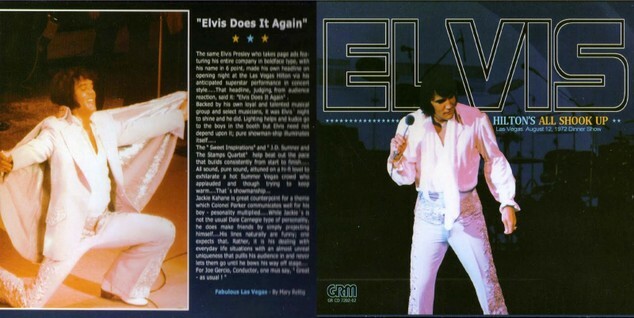 All things considered this is a great dinner show from August 11, 1972 at the Las Vegas Hilton with Elvis in a confident mood, giving excellent performances on almost every song, and generally seeming to enjoy being on stage. If you have ELVIS AT FULL BLAST you will have the midnight show from this same date and can treat yourself to two great performances with a varied song selection from the same evening in Las Vegas. This is a cd that should be added to any collection. I would like to see more soundboards from this engagement, especially one featuring the first live performances of "Steamroller Blues."